When you think of classic shoot ‘em ups, the first game that might pop into your mind is the 1981 classic Galaga; a game that created such an easily accessable formula that it had become renown widely. In the game, you would fly forward, and enemies would come down screen in an orderly fashion and try to blow you up. You were armed with a turret that could be upgraded with power-ups dropped by some enemies after killing them. Many games have come and gone since then, all bringing their own new ideas to the table. 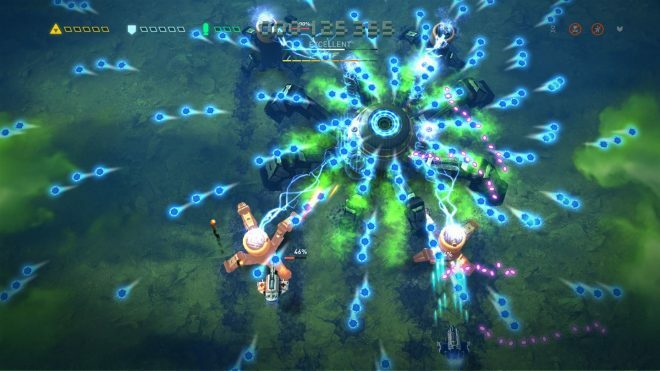 Now we find ourselves in 2017; thirty-six years have passed since the original concept had been released and Infinite Dream’s Sky Force Reloaded has flown in to show there are still fresh new ideas to keep the game airborne. 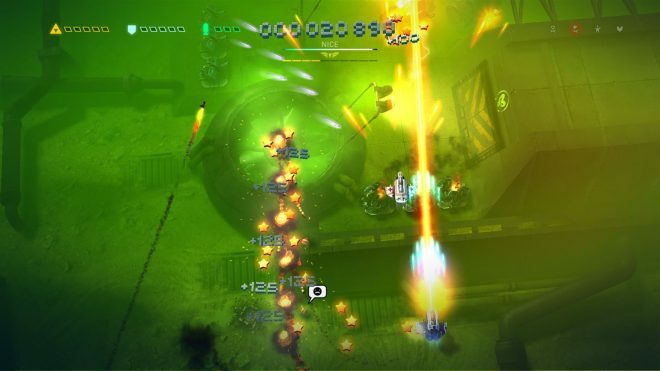 Sky Force Reloaded appears absent when it comes to a story. During the game, you will be playing as one of the best pilots around. An arrogant general named Scarlet is unleashing chaos all over the universe, and it’s in your best interest to stop her. Unfortunately, though, your main ship is destroyed, and you find yourself defenseless. Luckily, your general gives you a new ship, a vessel that has you starting from the bottom with no upgrades. At this point, you’ll find yourself playing through levels earning stars, medals and even new ships so that you may rearm yourself and stop Scarlet. Other than a sentence or two of dialogue from certain levels, that’s about all you’ll experience story wise. Time to plot your course! Prove yourself! – The game offers 15 unique levels to fly through, all of which increase the difficulty steadily as you progress. Starting out, simply completing a level will unlock the level that follows after. The further you go, a certain number of medals are also required to unlock a level. Medals come in 4 different challenges in each level, all with certain criteria that needs to be met to earn the award. This can range from defeating between 70 – 100 percent of the monsters in a level, rescuing all the civilians in a level and even completing a level without getting hit. Once a medal is earned, the challenge is done, meaning a player is not required to do all 4 challenges in one go (in some of the later levels, that would just be asinine). 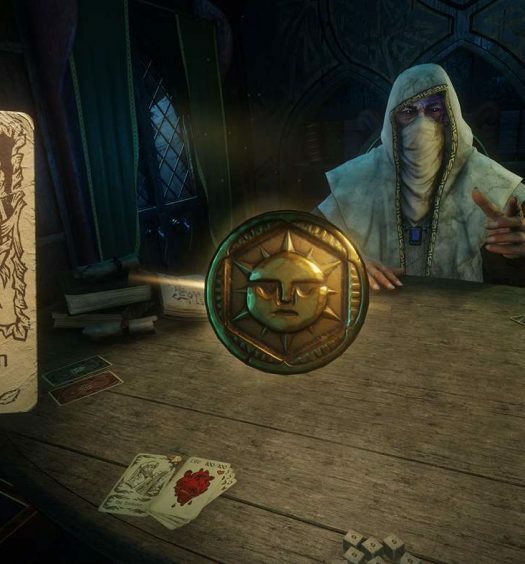 While some of these medals may be unlocked accidentally just trying to complete the level, others may require you to play through the level multiple times to earn it. The game allows you to upgrade your ship on the fly, and when upgrades are applied the difference applied is noticeable, which can also help with challenge completion. Once all four medals are earned, you’ll unlock the next difficulty level of that mission with bumped up enemy difficulty and 4 new medals to earn. Card Shark – Your ship allows you to upgrade many different aspects from the main cannon to the health of your vessel to even how strong the magnet that pulls in loot. These upgrades really do become handy throughout the game but some would find that it’s not enough. Luckily with the addition of cards, the game pushes to offer even more to help power you up. Cards are found randomly while playing through various levels. After picking up a card, the player is then required to complete the level. If the player dies before the level is completed, they will lose the card, and the card’s location will change to a different level. There are two types of cards. Blue cards, labeled as “Time Cards,” offer increased damage to a specific ability or increased drop rate of other cards and stars but are only active for 15 minutes. After the time is up, the card is removed and you no longer have the bonus. Then there are the orange cards, which are labeled as “Star Cards.” These are permanent and give your ship new unique abilities. Some examples of these abilities include an upgrade to the main cannon damage output and a rope that allows you to rescue civilians faster. Pilot Wings – Sky Force Reloaded starts you off with a ship that has no power and no appeal. It’s bland to look at, and it’s almost as if you were piloting a paper airplane around with how little damage you can take. Similar to how cards work, as you progress through the levels you may come across a little token with a wrench icon. This token is a piece for a ship. Ships require 5 parts to complete, and the locations of these parts are completely random. After a ship piece is grabbed, you will need to complete the level to add it to your collection. If you die, you lose the part, and the location switches to another level. The ships themselves tend to offer a positive and negative feature that makes each unique. The ship I found myself using the most greatly increased the chance of finding a card during a level, however, it also had extremely low health and even with a fully upgraded health stat still led to a one hit kill. This type of plane follows the scheme of risk and reward. The bonuses aren’t the only difference on each plane, as every plane also comes with their own unique weapon firing mode. There are 9 total ships in the game, so it does give the player a lot of choice in finding something that fits their play style. Technicians – Just when you think that the game couldn’t offer you anything more to help you in your fight against Scarlet, you unlock your first technician. As you play through the game, everything from defeating enemies, to rescuing civilians will earn you points towards objectives that are found on the main menu. These objectives offer 3 tiers of challenges that when completed grant you prestige rank for that particular challenge. After earning a certain amount of prestige rank, you will then unlock a technician. Similar to cards and ships, these characters will offer you one unique ability to further aid you in your fight, the difference here however is that these characters do not have anything negative to counter the bonus you’re receiving. I found technicians to be a huge part of my play style. One technician offers the ability to cover one hit to your plane, meaning that if you’re trying to go for the challenge medal for not getting hit in a level, taking one shot will not immediately void the challenge. Another technicians’ ability to slow down the enemies’ shots came in extremely useful during the last level of the game, as it gave me a little bit more time to react when things started getting heavy. Heat Seeker – One specific level of the game works differently from all other levels. The first time you play through the level, you are required to fly through a shield that immediately deactivates all your weapons. You have no way of fighting back and are required to use patience and accuracy to fly through all the traps trying to ruin your day. At this point, the level didn’t bother me. It was later on in my playthrough that I had obtained a card that deactivated that same shield. The thought of finally running through the level with guns blazing destroying everything in my path… except not. Yes, the shield is gone, and you are able to shoot, however a secondary defense system with an E.M.P Rocket launches right in the beginning of the new level. This rocket is locked onto you and will follow you around like a lost puppy for the entirety of the level. I have tried countless times to avoid this rocket with fancy flying tricks all while trying to shoot the various traps ahead of me, but eventually either the rocket catches me or I fly into something volatile on accident and blow myself up. While I understand that there still needed to be some sort of challenge with the level this was a step in the wrong direction to do so. There is no way to blow up the rocket nothing you can do to stop it. I expected minor pickups throughout the level to be present that cause the rocket to lose your signal for a brief moment to give you a breather. But alas, it can leave the player with a bigger headache than they bargained for when trying to achieve the medals for the level on higher difficulties. Sky Force Reloaded is everything that I wanted it to be and more. The challenge that is presented is strong, but with the many various ways to upgrade your load-out, it really helps to always keep you one step ahead. Even a little grinding might be necessary between levels at times, but it’s not to the extremes that one would find themselves stuck at a certain place for a long period of time. At the time I was grinding stars for upgrades, I was also trying to find new cards and ship parts at the same time, so there was always a purpose for replaying past missions I had already played through several times. 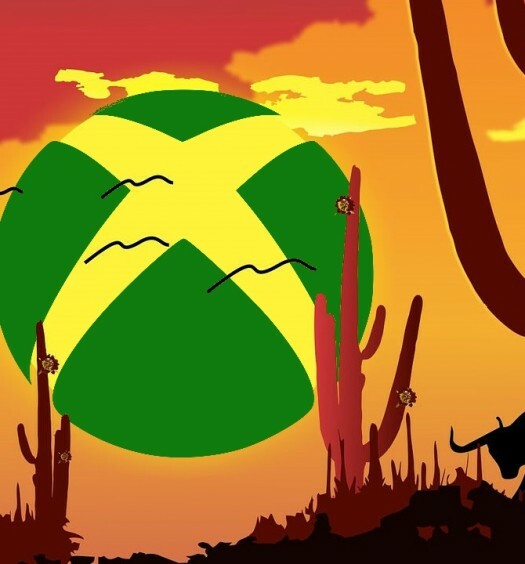 The replay value that every unique level offers up, as well as the four difficulty levels that each level has to offer assures there is always a challenge waiting to be tried and conquered. 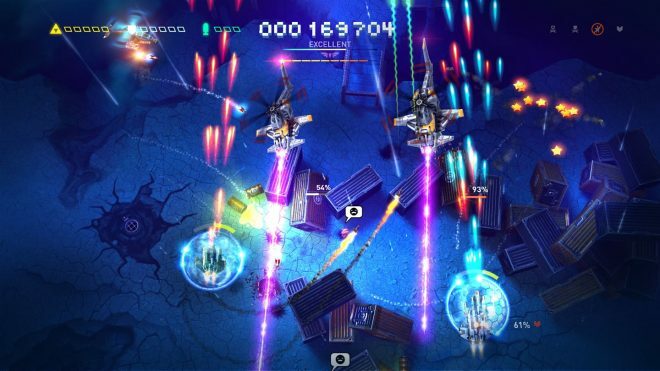 If you are looking for a game that keeps its overall design simple but still offers a fair challenge, Sky Force Reloaded may just be what you’re looking for! 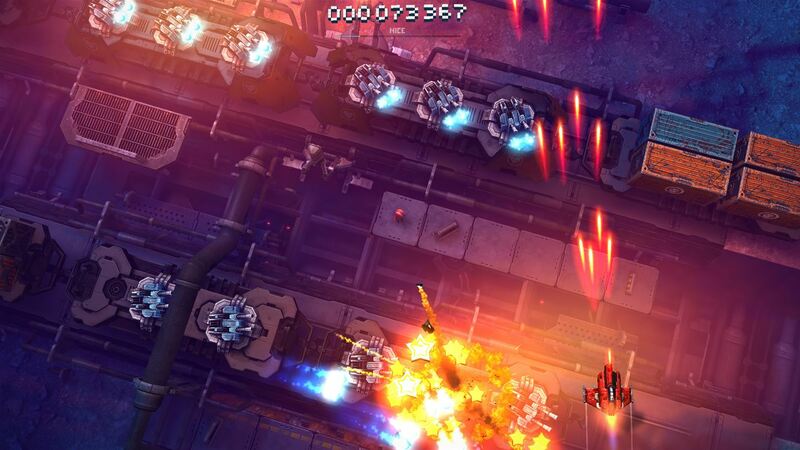 Sky Force Reloaded was developed and published by Infinite Dreams. The game released on November 30, 2017 for $9.99. A copy of the game was provided for review purposes.